Finally, a bit of finished sewing ... well, really just one thing, but it's something. Right? 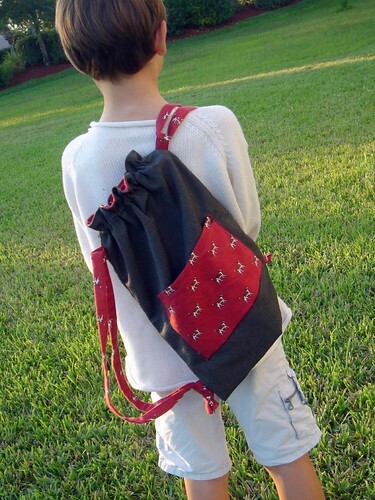 This is a backpack for a young teenaged girl named Erin. She's not a girly girl ... something I have a hard time grasping ... I am afraid I really like pretty and feminine. As I was developing this I'd call the buyer and ask if she was sure I couldn't put in a little pink, or a little ribbon, or a little floral and she'd laugh and remind me that she was quite sure. So black it is. And dog. 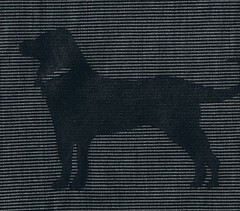 Black and dog. The dog on the front is a freezer paper stencil. I thought perhaps white (pink?) but figured I'd better stick to what the girl wants ... so black on black it is. I'm very pleased with the result. On the backside of the bag is a pocket. I'm not sure how functional it'll be but it's a great spot to put keys, a notebook and some pencils, or whatever the Erin might need at school. The straps are fully adjustable. 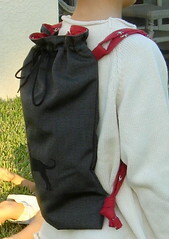 I. modeled it with both straps around his shoulders, it fit C. well with one strap around the shoulder and the other straight up the back. For someone the size of A. or K. the knots at the bottom would just be tied higher up. 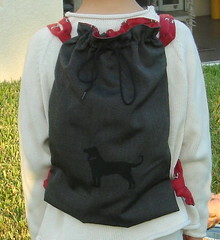 The bag is reversible too. 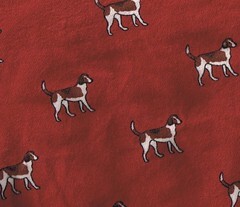 The other side is the red dog fabric, a soft but not babyish flannel. All Erin will have to do to reverse the backpack is pull the straps out of their loops, flip the bag inside-out, push the tie at the top through to the buttonhole located in the exact same spot on the reverside side, put the straps in and go. I'm hoping to get a few of these done for some boys I know and will do different appliques on each side, so they truly feel like they are getting two bags in one. See the small children in the background in the first two pictures? What hams ... there was no way they were being left out. They were making grass angels. On very dry not-really-grass grass. K. came in and said he'd never do that again because it hurt too much. I. was a wonderful model. It's not often I make something fitting for an almost 10 year old boy ... he's at an age where there isn't much that can be sewn by me for him. He's long past the age of little boy stuff and not yet old enough for dorm-room or first apartment decorating (and it'll be a long time before we get there!). Speaking of I. ... my sister is going to love this ... he lost another pair of glasses on Saturday. Last time he lost his glasses he dove into the lake at the cottage and his glasses sunk to the bottom. My sister, her children (mostly her son ... he's very brave! ), and my children spent the next two weeks diving for them, and not finding them in all the muck and weed. I did try diving once but I have a fear of getting my head wet and just couldn't do it, even with a mask on ... no, even thinking about it scares me to pieces ... I'm a wimp. After that episode, and me spending a day of our vacation in town with the kids getting a new pair of glasses, he was required to wear a croakie at all times. We didn't want the same thing to happen again. Well, last week the croakie broke. And on Saturday he went sailing. Need I say more? The glasses are somewhere at the bottom of the Caloosahatchee River. I'm tempted to go on about how it's easy to make a croakie, or take the glasses off when sailing, but I'll restrain myself. C. already has two pairs of glasses in that river. And now I. has added a third. If we ever face a real drought and the water level of that river goes way down you can bet my children will be out there hunting for their glasses ... makes me wonder what else they'd find at the bottom of the river ... last summer Lake Okeechobee was really dry and all sorts of wrecked boats and other artifacts were found.